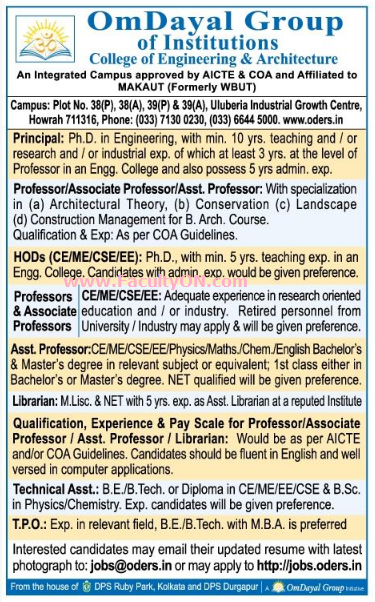 OmDayal Group of Institutions, Kolkata has advertised in THE TELEGRAPH newspaper for recruitment of Professor / Associate Professor / Assistant Professor / HOD / Principal Plus Non-Faculty jobs vacancies. Interested and eligible job aspirants are requested to apply immediately from 07th August 2018. Check out further more details below. About University: OmDayal Group of Institutions was incepted with a selfless motive – to improve the quality of education in Bengal and provide the best of facilities when it comes to knowledge sharing. The need of the hour was to revolutionize education in school the society laid the foundation stone for DPS Ruby Park. Today the school has become an educational landmark of Calcutta. As per AICTE / COA norms. HOD should have minimum 5 years experience. Principal should be Ph.D with minimum 10 years experience. How to Apply: Interested and eligible candidates are requested to send CV along with all copies of certificates / testimonials and recent PP size photos to the email address provided here or Apply online.